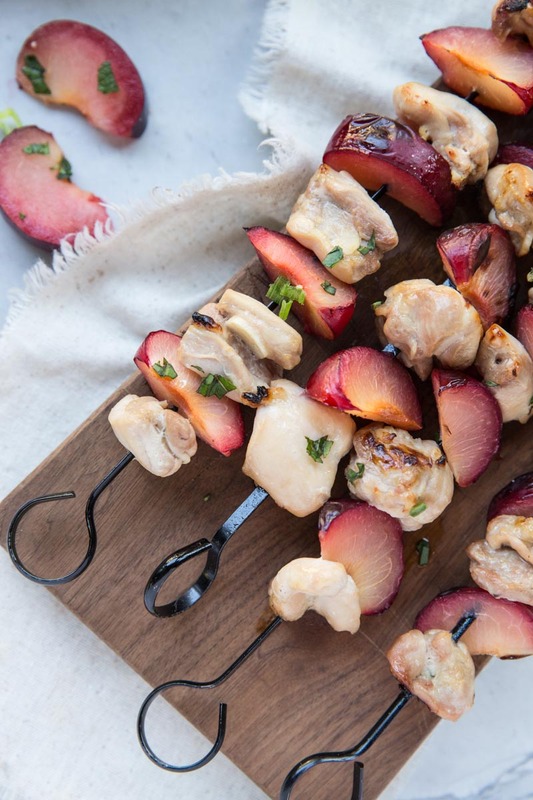 Change up your Summer grilling routine with these Asian Chicken and Plum Kebabs. This easy recipe can be made in 30 minutes in the oven or out on the grill. This recipe is Sponsored by Harmons Grocery but the recipe and all opinions are my own. Every few months my local grocery store, Harmons Grocery, has a Big Meat Sale. And I mean BIG! They offer 5 packages of meat for $20. You can get a variety of beef, chicken, pork, and sometimes even wild caught salmon, all for $20. I often wait until this sale and then stock up my freezer. Then, I don’t have to worry about buying meat for a few weeks. After my freezer is stocked with a variety of meats I start dreaming up recipes like this one. I defrost meat overnight in the fridge then, the next day it’s ready! I also really like to cook the meat then freeze it so I have cooked meat on hand for quick meals like Greek Chicken Bowls, Chicken Tacos, or to top salads like this one. This kebab recipe is made with fresh chicken or chicken that has been frozen then defrosted. • I like to use chicken thighs with this recipe since they naturally have more flavor but feel free to use chicken breasts if you’d prefer. • I used 4 plums for the recipe but if your plums are small you may need 5-6. • The chicken can marinate in half of the sauce for 10 minutes or up to a few hours before cooking. 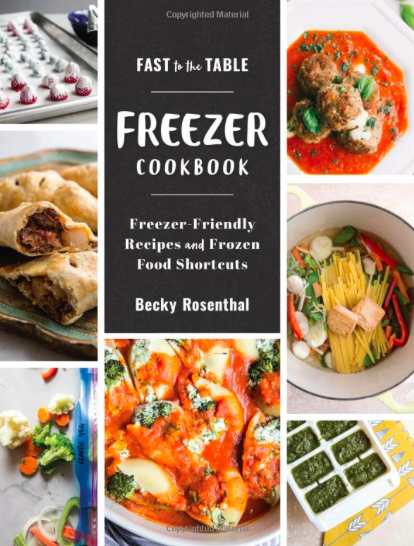 • For the sauce, there are a few ingredients you may not already have in your pantry. Coconut Aminos are a healthy, paleo, gluten free and vegan, replacement for soy sauce. They are made from aged coconut sap and salt, no soy or MSG. Sesame oil is another item you may not have around. It is a pressed oil from sesame seeds with many health benefits and a strong concentrated flavor. If you can find toasted sesame oil get that one, the darker the oil, the more enhanced the flavor. 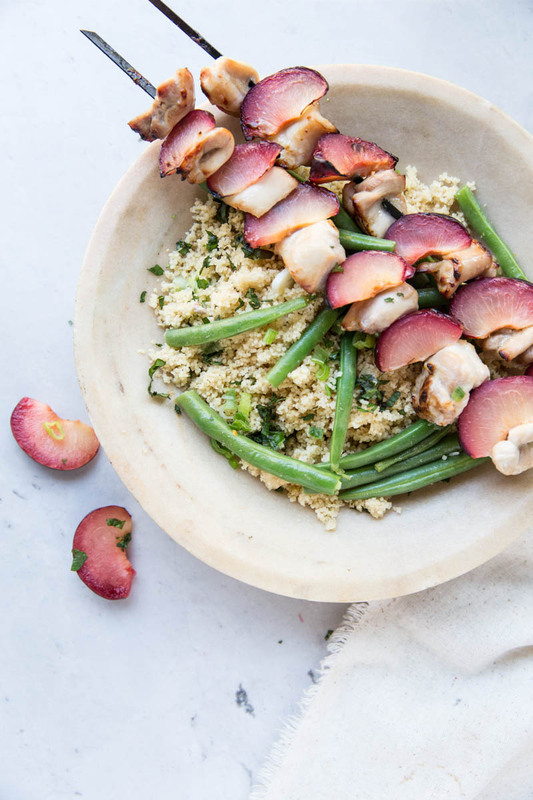 • To make this full meal in 30 minutes, you’ll want to have the sauce reducing and the couscous cooking as the chicken is roasting. Make sure to read through the whole recipe before starting so you can have several things going at once and have everything ready at the same time. 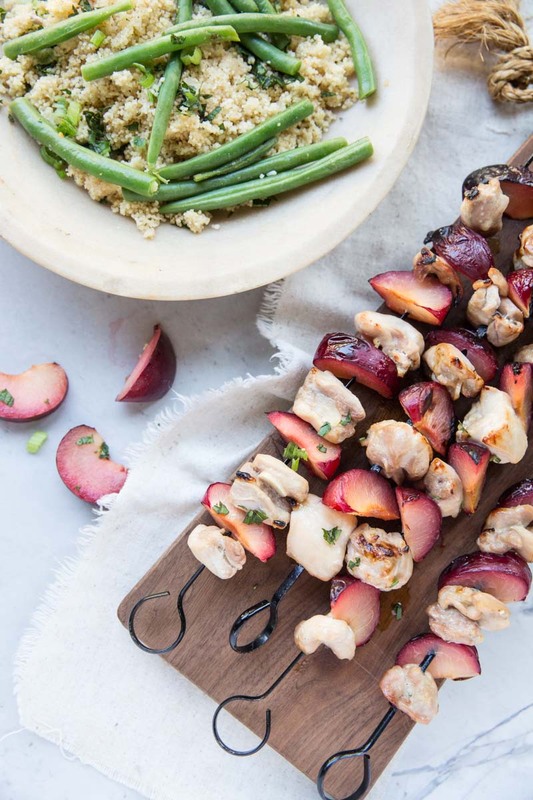 A fun Summer spin on Chicken Kebabs with Plums and an Asian sauce. Heat up grill or oven broiler on high. For broiling, line a large rimmed baking sheet with foil. Cut chicken thighs up into cubes. Slice plums up into 6-8 slices each. Reserve 1 of the plums sliced for the sauce. Mix together the marinade sauce (garlic, ginger, coconut aminos, honey, lime juice, sesame oil, and oil). 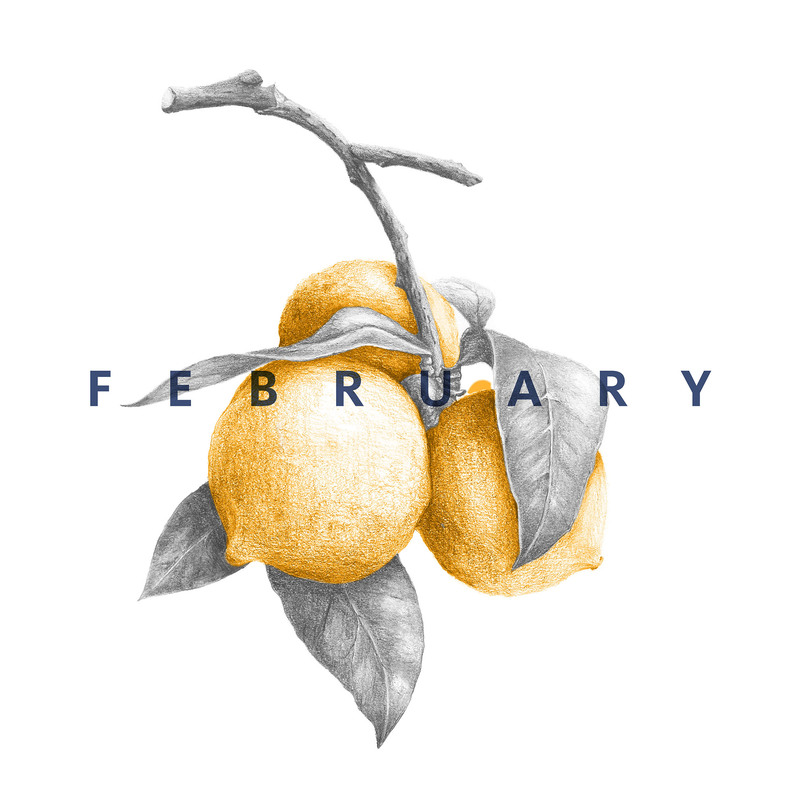 Set aside the vegetable broth. Spoon half of the sauce mixture over the chicken to marinate. You can let this sit in the fridge for 10 minutes or a few hours. 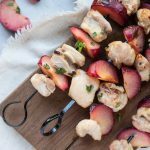 Thread the chicken and plums onto the skewers and place onto the prepared baking sheet. Roast in the oven on broil (top rack) or on a grill; cook 4 minutes on each side. Then reduce oven temp to 350 and continue to cook on a lower rack for 5 minutes. Place the second half of the marinade sauce (with any slices of garlic and ginger) in a small pot over medium low heat to reduce. Add in the vegetable broth, and the extra sliced plum, and reduce while chicken cooks, 10-12 minutes (simmering). While the chicken cooks bring a pot of 1 1/4 cups of water to a boil. Add in the green beans and cook for 2-3 minutes until they turn bright green. Transfer the green beans with a slotted spoon to a bowl of ice water. Add the 1 cup instant couscous into the boiling water. Turn off heat and cover the pot. Let the couscous sit for 10 minutes then fluff with a fork. Toss with herbs and cooked green beans. 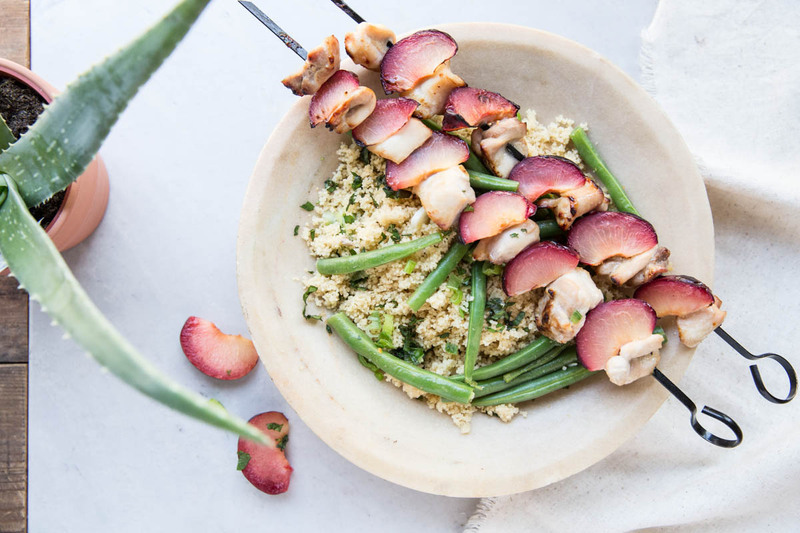 Serve chicken and plum kebabs over couscous with green beans and extra sauce. Coconut Aminos are a paleo approved substitute for soy sauce. You can also use Tamari, gluten free soy sauce. Whether you're using an oven broiler or a grill, you'll want to cook the chicken until it reaches 165 degrees. Chicken thighs, since they are dark meat, will remain slightly pink even when they are cooked.